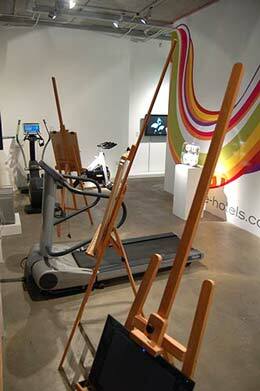 CHELSEA space and The Centre For Drawing present the Life Room, a unique combination of art studio and gym consisting of a series of apparatus for fitness and drawing – running machines and easels, cycling machines and drawing boards, plaster casts and plasma screens. 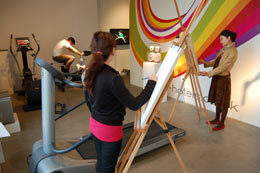 the Life Room is open to the widest possible audience and uniquely encourages participation in art and fitness in one space, inspiring new ways of thinking and creating. You are invited to "join" the Life Room and will be able to train or draw independently and there will be a series of 'Masterclasses' from artists, historians, fitness experts, and physicians. The sponsors of our gym equipment, Village Hotels and Technogym (official supplier of the Olympic Games in Beijing where the company equipped 20 gyms for 12,000 athletes) will kindly be presenting a series of demonstration events throughout the exhibition. What could 'life drawing' mean or be in the 21st Century? The life drawing studio was once the heart and lungs of every art school, it was the meeting place where students learned not just about drawing, but also the history, theories and theology of art. the Life Room is not a performance space, it is a rehearsal space designed to build physical and psychological strength, endurance, observation, understanding, confidence, and wellbeing. This project is an enquiry into what might constitute life drawing in the digital age and is search for a new cultural and social space for the future. In the late 20th and early 21st century the rise of the fitness gym represents a new realisation of the Olympian ideal and classical beauty; a place where people work on and observe the human form and where individuals can recreate themselves by sculpting/modelling their bodies through exercise. The gym presents an ideal site for the artist to observe the human form and create images - a place to see and be seen and to contemplate the intricacies of the human form. Within the wider programme at CHELSEA space this project relates to a series of enquiries into the possibilities of 'live' action, performance, discourse and rehearsal played out in the context of seemingly 'set piece' exhibitions. the Life Room will be a complete environment including gym interior design elements from Village Hotels; life drawings by William Orpen, Peter De Francia, David Ferry, Mario Dubsky and Mick Jones; photography by Hugh Gilbert and renowned sports photographer Leo Mason, videos curated by RUN Gallery, and computer generated work by digital scenographer David Barnett. Key pieces in the Technogym product collection are designed by internationally acclaimed designer Antonio Citterio. the Life Room takes its themes from historic and modern Olympic ideals and contemporary approaches to physical and intellectual wellbeing, culture, and learning. London 2012 will be a showcase of these themes at the grandest scale. 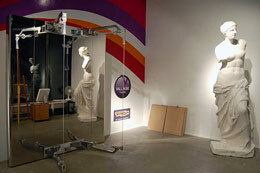 The project at CHELSEA space is a pioneering cultural experiment but is strategically timed in 2009 with the ambition that the Life Room could appear in museums, galleries, educational institutions and fitness centres across the country as part of the Cultural Olympiad and the 2012 British Olympic year.